The Best Eggless Christmas Fruit Cake is a soft and moist cake with tasty flavors of dry fruits, dried fruits, spices; bake this all time favorite fruit cake this Christmas for your friends and family! Christmas is undoubtedly a beautiful time of the year. It calls for celebration, merry making and eating your all time favourite Christmas fruit cake. 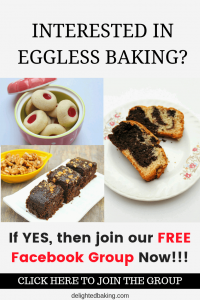 Here I am sharing an egglesss Christmas fruit cake recipe. 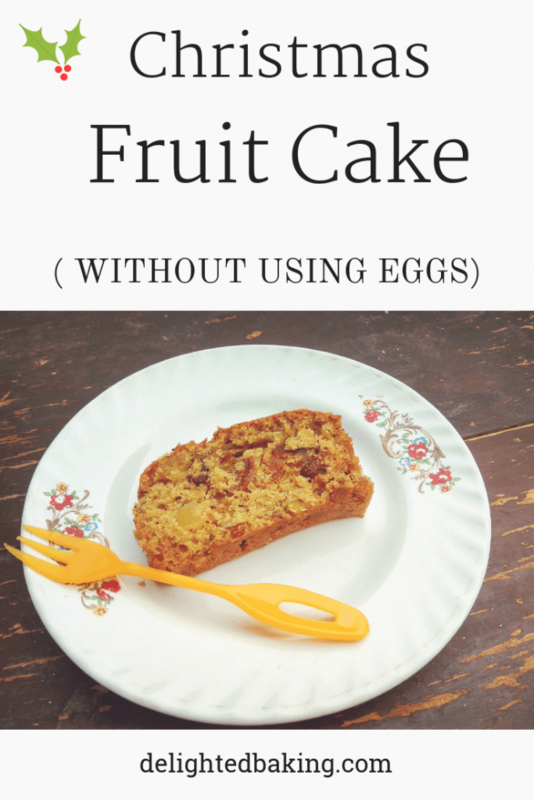 This recipe will surely become your go to recipe for an eggless fruit cake. This cake fills the entire kitchen with a beautiful aroma of cinnamon. I saw this amazing recipe on JoyofBaking , tried it and everyone liked the cake made using the recipe. This recipe is easy, simple and will give you the best results. I have made a few changes in the recipe. Original recipe uses nutmeg, cinnamon and ground ginger, I have used only cinnamon. Also I have added some more things in the recipe like tutti fruiti, grated lemon jest,dried pinnapples etc. Basically you should add a number of dry fruits and dried fruits in the cake. You can add chopped almonds, chopped walnuts, chopped pistachuis, chopped dates, chopped dried figs (anjeer), dried cranberrys, tutti fruit etc. Remember not to omit adding these as these dry fruits and dried fruits would give this fruit cake its real taste. Also, the original recipe has brown sugar. I didn’t have brown sugar so I have added simple sugar. 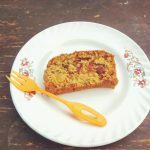 As this is an eggless fruit cake, we will add buttermilk (chhaachh). It’s quite easy to prepare buttermilk at home. For 1 cup buttermilk, add 1 tablespoon white vinegar or 1 tablespoon lemon juice to 1 up of milk. Mix with a spoon and leave it for 10 minutes. Your buttermilk is ready! Bake this cake on Christmas for your family members and friends. You can also give these as gifts to your family and friends. They would love to have a homemade fruit cake. Melt the butter . Keep it aside to cool down a little bit. If you are using homemade buttermilk, then add 1 tablespoon white vinegar or 1 tablespoon lemon juice to 1 cup of milk. Mix with a spoon. Leave this for 10 minutes. This will give you 1 cup buttermilk - the exact amount required for this recipe. In a big bowl sieve maida ( all purpose flour), baking soda and cinnamon powder. Add the dry fruits and dried fruits in this mixture and mix with the help of a spoon . See that all the dry fruits and fried fruits get coated with maida (all purpose flour). In a separate bowl, add melted butter and sugar. Mix till sugar dissolves properly. Now add buttermilk and mix well. Now add the dry ingredients and mix well. Add the dry ingredients little at a time, mix, then again repeat this process. Bake this at 180 degree C / 350 F for 35-40 minutes or till a toothpick inserted into the cake comes out clean. Eggless Christmas fruit cake is ready!